Columbia, Mo. 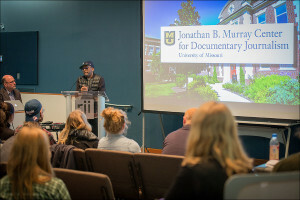 (April 18, 2016) — Filmmaker Spike Lee gave advice to young journalists and filmmakers during a special master class for the Jonathan B. Murray Center for Documentary Journalism at the Missouri School of Journalism. Lee was in Columbia on April 6 to premiere his hour-long look at the Concerned Student 1950 protest on the University of Missouri campus. He spoke in personal terms about his own life and career as well as presented his latest documentary on Michael Jackson. 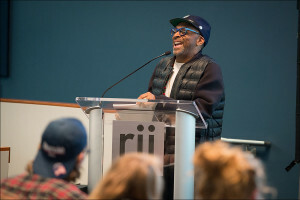 Filmmaker Spike Lee talks to a packed room of students and faculty at his master class. Lee began the class with the Jackson film, titled “Michael Jackson’s Journey from Motown to Off the Wall.” The film is the second documentary Lee has done focused on the career of the pop legend – all while steering clear of the singer’s troubled personal life and tragic early death. 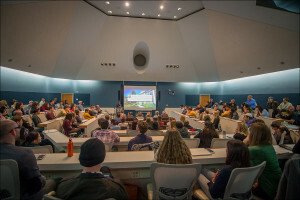 The assembled students saw images of Jackson most had not seen before, with laughter and tears from the audience sprinkled throughout the screening. On the film’s conclusion, Lee, who is on the faculty at New York University, answered students’ questions about his career and his advice for their futures. One asked about his motivation for the Jackson documentaries. The first one, “Bad 25,” was produced on the 25th anniversary of Jackson’s 1987 album “Bad.” Lee plans to direct a documentary about 1982’s “Thriller” album in the near future. Lee said his work is based on what is important to him, what he sees as being overlooked. He prickled at the use of the word “controversy” in a question from one student. Spike Lee laughs about some of his filmmaking experiences. “When stuff I do sparks, not necessarily debate, but discussion – one of the main objectives of “Chi-Raq” was to bring a spotlight to the self-genocide that’s going on on the south side and southwest side of Chicago, which no one’s talking about,” Lee said. Much of the advice from the veteran filmmaker focused on life skills the students could take to use in their careers ahead. Hearing the word “assume” in one question, Lee launched into a lecture on the ills of that word. “Never use the word ‘assume.’ People get fired in the film industry using that word. ‘Well, I assumed, I thought…’ No, no. Delete that word ‘assume.’ Delete it,” Lee said. Near the end of the event, Lee gave a detailed and personal recount about his own school days. Lee said he wasn’t a model student at Morehouse College in Atlanta, describing himself as “D-plus, C-minus student, just barely making it” during his freshman and sophomore years. Spike Lee answers questions on a broad range of topics. With that gift, Lee spent the summer of 1977 shooting film all over New York. He returned to Morehouse and turned his footage into a film, becoming an A-plus student along the way. Associate Professor Stacey Woelfel directs the Murray Center for Documentary Journalism, and Robert Greene serves as filmmaker-in-chief. Jonathan Murray, BJ ’77, founder and executive consultant of Bunim/Murray Productions, gave a $6.7 million gift to the School in 2015 to create the Center. The goal is to provide innovative teaching, professional outreach and research programs at the School that will bring together talented students, faculty and professionals from around the world.